veryMovingPictures is run by Kevin Reynolds. Kevin has been making films for over a decade. He has made pop videos, comedy, art-house, documentary and films that touch on a variety of other genres. He has also studied film academically. In 2012 he was awarded a Phd in History at the University of Sussex. His dissertation was entitled ‘That Justice Be Seen: The American Prosecution’s use of film at the Nuremberg International Military Tribunal’. 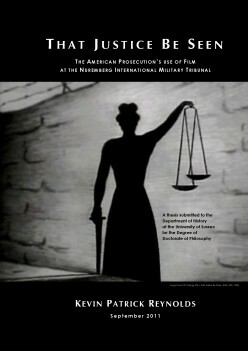 For an example of published work, see: Kevin Reynolds, ‘Banking Against Humanity: The Holocaust, the Reichsbank Loot Film and the American Prosecution at the Nuremberg International Military Tribunal‘, History, Vol. 98, No. 332 (2013), pp. 511-29.